While useful and cute shower gifts are always nice, a funny gag gift can get a good laugh out of everyone and lighten the spirits of new parents who might be a bit nervous. There are some excellent options out there for shower gifts that will leave the mom- and dad-to-be chuckling for many months to come. If you're looking for the perfect gag gift, you are only limited by your imagination. Try one of these gift ideas on the expectant parents or shower guests, all of which are guaranteed to garner a laugh. A Diaper Duty Survival Kit makes a great gag gift for new parents or grandparents. This hilarious option from Party City includes protective gloves, tongs, safety goggles, and nose plugs. It retails for $13. Any new parent quickly learns, parenting is tough work and you don't always feel prepared. These Parenting Decision Dice from Party City lighten these tense moments by showing just how random new parenthood can be. One die in the set determines whether Mom or Dad will handle it. The second die tells what task that parent must do from taking a nap to giving the next bath. The set retails for about five dollars. The Prank Pak Crib Dribbler from Amazon is a hilarious option for presenting your gift. The picture on the box features an amusingly awful rodent-style baby feeding and watering system. Your real gift goes inside the box. Other designs include My First Fire, which features an image of a child at a small fire pit or the Nap Sack, a bag that goes over a parent's head so they can get some sleep. This choice is sure to get a laugh at any shower and retails for eight dollars. Grab some baby-safe pacifiers, or dummies, that feature luscious lips and funky teeth to make it look like baby's got a wacky mouth. The 5-Piece Baby Prank Soother Set costs about $30 and comes with five different pacifiers three with different types of buck teeth. The new parents will laugh when they receive the gift and everyone else will get a laugh when they see baby using one! This homemade gift is best for small showers where everyone is well-acquainted, and you can be sure you won't offend any of the other guests. To make it, you'll need a gel bra, a hot glue gun and glue sticks, and two water bottle caps with nozzles. Remove the caps from the water bottles and hot glue them to the center of the cups of the bra. Then package it up and present it to the parents-to-be at a co-ed shower. Get your guests in on the goofy fun and gift them homemade babysitting coupons as their favors. Use a homemade coupon template like those for Father's Day, Mother's Day, or every day to get started. Add tasks you'll want friends and family to do for you after baby is born such as "Babysit one Saturday night" or "Make dinner on a weeknight." The more involved your tasks, the funnier they'll be when guests realize they have to redeem the coupons one day. Print out the funny coupons and staple a few into a small coupon booklet. Thank guests for their future help as they exit the shower and you hand out the favors. Anyone who has spent a lot of time with a newborn knows that crying is just part of the package. Make your own set of new parent ear plugs by filling a zip-top bag with small items parents could shove in their ears for a moment of silence. Add a pair of each item such as craft pom-poms, mini corks, and pencil-top erasers. Make sure to include a label on the bag! 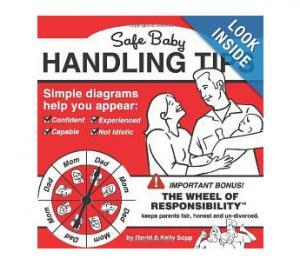 Another great option is the book Safe Baby Handling Tips by David and Kelly Soppy. From instructions for how to lift the baby (not by the head) to nursing tips that will have you rolling on the floor, this book will be a hit with the new mom. It even comes with a responsibility spinner on the cover to help new parents decide who has to change that diaper. This book retails for about eight dollars. Taking care of a child is expensive! Ask guests to help contribute to your baby's future with gag favors that are mini piggy banks. You can purchase small banks or make your own with a little gift box and a pink marker. Add a note to the bank that says something like "Contributions to Baby's future due back to the Jones' by December 20th!" Prank the new parents with a seemingly inappropriate baby item like the Chill Baby Lil Lager Baby Bottle for under $10. This usable ten-ounce baby bottle is designed to look like a bottle of beer from the bottle cap lid to the brown plastic body and lager label. When you have parenting emergencies, you'll go running to your friends and family for a reprieve or some helpful advice. Prepare them in advance by giving out personalized mini alcoholic drink bottles that you make or buy as game prizes. Label each with a different parenting dilemma such as "The baby's been crying for eight hours straight" or "We ran out of the good diapers!" As you hand out each one, let the guest know you'll come running to them for that drink when the event on the label occurs. Make your own manly apron for changing diapers to give to the expectant dad at a couples shower. Use a men's button-down shirt that's about two sizes too big for the dad-to-be and cut off the sleeves to make a no-sew apron. You can also find a free pattern for a men's style apron to sew. Use clothespins to attach funny diapering supplies such as a dust mask, sturdy gloves, heavy duty trash bags, a diaper, and a travel pack of wipes to the waistband of the apron. Make sure it's obvious the gift is a gag. Choose gifts with packaging that don't look too realistic, especially if the gift could be misconstrued as dangerous or offensive. Consider reserving naughtier gifts for smaller gatherings where you know everyone. If the mom-to-be's grandma will be there, she might not be as amused. Avoid poking fun at things that really bother the parents-to-be. For instance, if the mom-to-be is worried about her size, skip maternity t-shirts that make jokes about it. Don't make the gag gift your only present at the shower. While the gift is funny, the shower's purpose is to help the parents-to-be get ready for their newborn. There are dozens of great gag gifts that are perfect for baby showers. 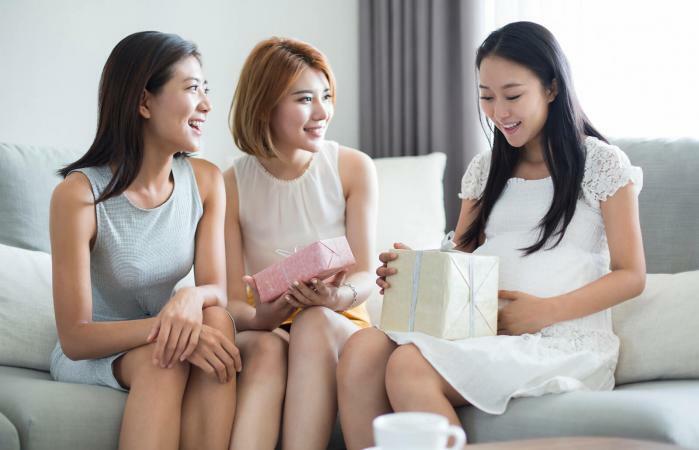 No matter which one you choose, you'll help break the ice at this social gathering and have everyone talking and laughing about your funny gift idea for years to come.